If you have insurance and want to figure out if it will cover autism in 2016, Autism Speaks has an on-line guide that can help you figure that out. Medicaid covers autism up to age 21 and CHIP provides affordable coverage. Both programs are means-tested, so your family may have too much income to qualify. You can learn more about insurance and coverage options in Utah here and here. If your health insurance isn’t going to cover autism in 2016 and Medicaid and CHIP are not options, you might want to consider going on healthcare.gov to purchase a plan. Enrollment is open from now until January 31st. If you purchase a plan by December 15th, coverage will begin on January 1st. If you purchase by January 15th, coverage will begin on February 1st. Plans purchased between January 15th and 31st start coverage on March 1st. How much these plans will cost depend on your family’s financial situation. 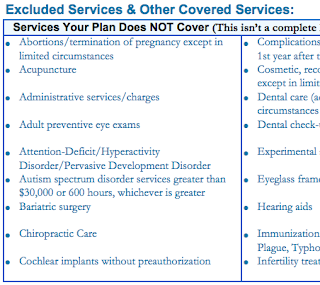 The website is set up to walk you through all that, but you can look at plans without entering everything - go to healthcare.gov, click on “preview 2016 plans”, put in your zip code, and hit "skip" twice and click on “go to full-price plans”. The plans typically have different levels of coverage from bronze to platinum, with different deductibles, co-pays, co-insurance, and maximum out-of-pocket. Which plan is best for your family depends on your situation. To look at a plan, click on "Learn more about this plan", and you'll be taken to a page with links to "summary of benefits", provider listing, and plan brochure. The summary of benefits uses consistent terminology across all plans, so that's a good tool for comparison. Autism coverage will generally fall under "Mental/Behavioral health outpatient services". Some of the plans don't cover if the provider is not in-network. One thing to watch out for is per visit co-pays. If an ABA provider is coming 5 days per week with a $50 co-pay every time, things will add up quickly. Pay close attention to the maximum out of pocket expenses. Depending on what sort of treatment plan you have, you may be quite likely to hit that. Note that some plans don't count mental health expenses against the out of pocket limit. This spreadsheet lists all the Utah ACA plans, with numbers assuming a family of one parent + one child. Thanks, Mirella Petersen, for making it available. Do you have providers who can diagnose autism and provide behavioral therapy? What is the process for finding a provider if there's not one in network? Do you provide coverage beyond the minimum required under SB57? Can you confirm coverage of the following CPT billing codes: 0364T, 0365T, 0368T, 0369T, 0370T, and 0371T? It looks like we have a large number who have an interest in autism and could provide a diagnosis. I don't see anyone with BCBA credentials. We can handle things on a case-by-case basis, but if there's a need for providers, we try our best to get them in network. No - we're in line with SB57 in terms of age and therapy caps. Our system isn't set up for those codes yet, but when the coverage begins we should if those are autism treatment codes. The U of U plans specifically say that autism is covered. We have psychologists, psychiatrists, and social workers. We're currently working with UNI to contract for ABA services. That won't be ready until January. Our providers are concentrated in the University of Utah, so this plan is most beneficial to people who can access those providers. If you're out of network, there's an out of network cap. No - our coverage matches SB57, as specified in this document. I don't have the codes, but a case manager will call you back with that info. I don't know - I don't know anything about autism or who diagnoses it...we have doctors. Is it a mental health thing? We contract that out - you could talk to them. We don't specifically cover autism, but we do cover medically necessary mental health treatment. We do have those codes in our system, but it says that prior authorization is required. Humana doesn't mention autism, but excludes "Services and supplies that extend beyond the period necessary for evaluation and diagnosis of learning and behavioral disabilities or for mental retardation." I was never able to get a good connection with a Humana representative. If that changes, I'll update this. To make a good choice, you need to make the most accurate guess about what your expenses are going to be. If you're looking for behavioral therapy, contact a behavioral therapist and explain what you're trying to do. If you don't have an official diagnosis yet, you will need to figure that in too. You needn't hesitate to call the customer service line for an insurer you're considering. It may cost you some time now, but it can save you money in the future. Keep in mind that autism coverage is new in this state and things are still being sorted out. Those customer service reps may not know the answers, but it's part of their jobs to find out and help you.